Todd Douglas Miller’s documentary, “Dinosaur 13,” spins a classic tale of American greed and the ways in which it halts progress in its footsteps. The bones belonging to “Sue,” the most complete Tyrannosaurus Rex ever unearthed, were found in 1990 but remained in boxes for a decade as the paleontologists who discovered her, including Peter Larson of the Black Hills Institute, faced opposition from the U.S. government, competing scientists and others. Their biggest adversary was Maurice Williams, who owned the land where Sue was found and was paid $5,000 by the fossil dealers before he claimed that the bones were still his property. Miller’s film unfolds like a thriller and is sure to reawaken controversies regarding the ownership of arguably the world’s single most priceless and vital skeleton, which has been on display at Chicago’s Field Museum since 2000. 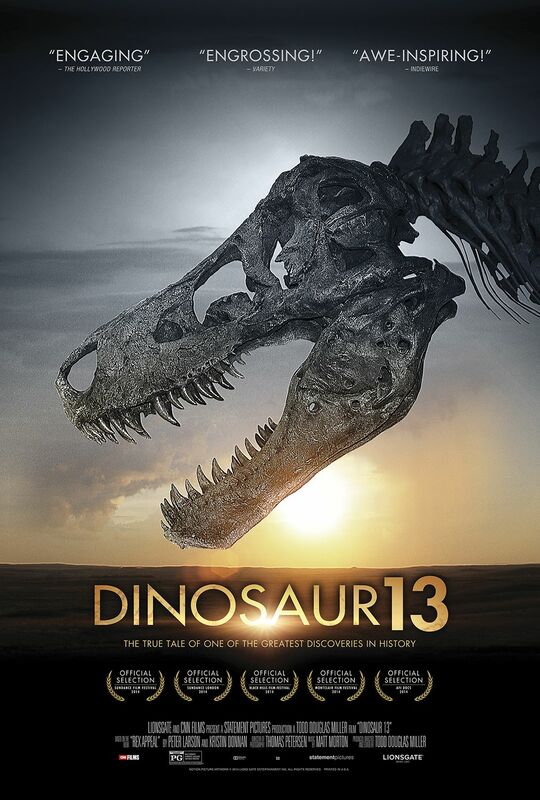 "Dinosaur 13" opens in select theaters Friday, August 15th, and is also available On Demand. Miller and Larson spoke with RogerEbert.com about their thoughts regarding Sue’s fate, new threats facing scientists and how Pete’s discovery served as the inspiration for an iconic screen dinosaur. How did you first begin your collaboration? TODD DOUGLAS MILLER: I had read Pete’s book, “Rex Appeal,” and I was just fascinated by it. I thought it was amazing. It’s a lot more wide-ranging than just what you see in “Dinosaur 13.” It talks about the science behind the Tyrannosaurus Rex and his memories of the last twenty-some years. I really thought that it needed to be told in a cinematic way. I read it as a visual representation and I wanted to see it up on the screen. Pete had some offers before we approached him, and we pitched to tell the story in a different way. PETER LARSON: [My ex-wife] Kristin [Donnan] and I were both very impressed with Todd. She was the co-author of “Rex Appeal,” and it actually started off as two books. There was a book on the science and a book on the politics and we combined the two together which makes for more interesting reading because it’s all interlinked. We’re learning about dinosaurs while we are learning about politics at the same time. It was pretty clear when we met Todd that he is the genuine article. We fell in love with him and became part of the crew. That’s the way it began. TDM: Kristin and I had done so much research. That was her job, to tell Pete’s story. We initially worked very closely to get everyone involved. She had contacts for all of the characters, and then they gave me the freedom to go off and treat it as an objective case study of these events. Because I was coming at the story from an objective angle, more people started coming out of the woodwork as time passed. It’s led us to learn new things for the latest edition of the book. The whole experience has been a real pleasure. You don’t meet people like Pete Larson every day. He is exactly what you see in the film. He’s an absolutely honest, unique and optimistic person and has one of the biggest hearts I’ve ever seen in a human being. Probably the biggest. It’s just nice that people are going to see his story here in Chicago and worldwide. It needs to be appreciated. How were you able to maintain your optimism and sanity during your prison sentence? PL: During bad times, there are some wonderful things that happen as well. Even before I went to the slammer, that’s what I wanted to concentrate on. There was always another raid to contend with and another subpoena that we had to answer. But we had our work to keep us going, and we also had all the wonderful people who protested in support of us. While I was in the slammer, I answered 1,997 letters from people, most of whom I had never met. They would send money for me to have phone calls, which cost 25 cents a minute, where I would connect with my family and my business back home. My story was such a weird one that it soon spread throughout the prison. I ended up gaining many [acquaintances] that I guess you could call pen pals [laughs] and in fact, I’m still in contact with some of them. I also got to learn about all sorts of things. I learned about prison and the prison system and a business called Unicor which is another story—[laughs]—it basically uses prisoners as slave labor. I learned about many things that I was never curious about but now I may be able to have a positive effect on. Spielberg’s 1993 phenomenon, “Jurassic Park,” was released in the midst of the battles for Sue. Do you believe this film had a positive impact in regards to championing your work? 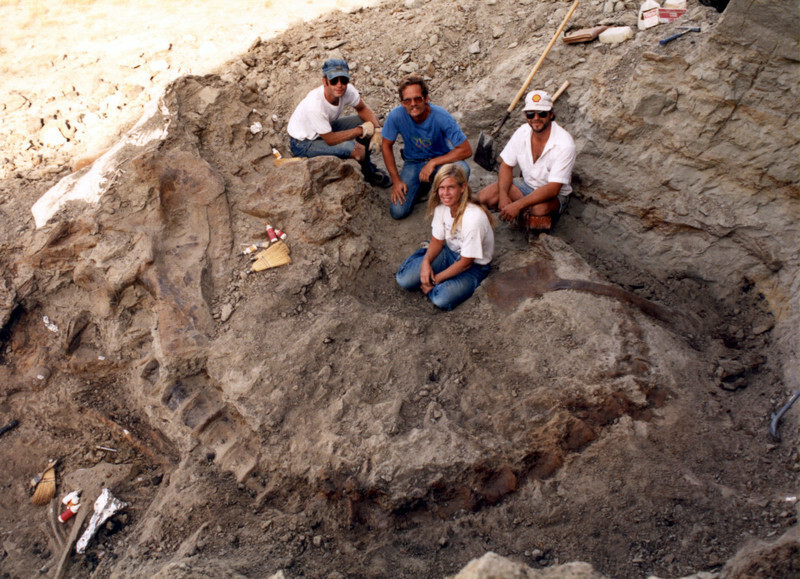 PL: “Jurassic Park” movies have been awesome for the science of paleontology. Not only did they raise awareness about dinosaurs but they actually educated people about them. They enabled us to see dinosaurs behaving in interesting ways and the first movie was pretty spot-on on a lot of things. There were some mistakes, of course. A Camarasaurus does not chew its food, it just rips off leaves and swallows them. That aside, the movie showed these dinosaurs for the first time in a way that made us believe they were alive. Ray Harryhausen did some fantastic stuff with animation, but this is really the first time where audiences could look at something that actually resembled a real, living, breathing entity. Interestingly enough, the CGI people used Sue’s measurements to create the proportions for the Tyrannosaurus Rex. And that came from us through [paleontologist] Bob Bakker, which is pretty cool. What inspired you to shoot the film in a lush widescreen format? TDM: We really thought it needed a big canvas. The film was shot in CinemaScope and we spent a lot of time getting the sound mix done. When you go out west, you’re looking at these vistas in the Badlands and the location lends itself to a big widescreen format. Being from New York, I’m not used to seeing a good nighttime sky. There’s too much light pollution. But out west, it’s just transformative to gaze at the sky. We made sure to do many nighttime time lapses. I liked the inclusion of diagrams showing precisely how the Sue bones looked when they were found. They looked like pieces of the world’s most elaborate puzzle. PL: There were thousands and thousands of little fragments that were broken off and we were trying to fit them back together. A lot of them do go back together. When you’re looking at the texture of these things, it’s easy to get immersed in them. TDM: Not to make Pete blush, but you only find T. rexes in one locale and it’s Pete’s backyard. That’s why he has scientists from all over the world that come to his Black Hills Institute, which serves as a gateway to the past. Everyone makes their little pilgrimage to meet Peter Larson, Mr. T. rex, and visit the Black Hills Institute because of its collection of T. rexes before they go out on their summer digs. Most researchers will only get to spend a couple weeks or a month, if they’re lucky, on the field because of travel expenses, whereas Pete gets to do it all the time. PL: When a rancher calls and says, “I think I found a T. rex!” I can be out there within hours. [laughs] I’ll jump in the truck and go and see. What are your thoughts regarding the presentation of Sue at The Field Museum? PL: We all do things in a different way but they’ve done a fantastic job here. Every time I come to the museum, I watch how all the people look at Sue and I think, “This is awesome. She’s in a truly wonderful place.” Having her here is almost as good as having her in South Dakota, and they’ve allowed me free access to come and go as I please. They are always supporting my research. [Collection Manager] Bill Simpson has been especially great about providing access over the years. I was here about a week and a half ago and they rolled out the skull for me. I took some photographs and took a few more measurements. They’ve been very kind to me here. We actually got to show them how we prepared the fossils. Terry Wentz, the chief preparator of Sue, spent quite a bit of time here as well. Every fossil is unique and each preparation of every fossil is unique. Sue had some special problems that had to be fixed in order to get her bones clean and stabilized. Since this is the most important find of our careers, we wanted to share what we had learned about Sue and to do whatever we could to ensure she was featured in the best possible exhibit. We are having a meeting soon where we are proposing to increase that collaboration and even hoping to bring something of Sue—not actual bones—back home that we could have at a Sue exhibit in South Dakota. Why is Sue’s actual skull displayed separately from the skeleton? Is it simply due to its enormous weight? PL: There are a number of other reasons too. As a researcher, I want to be able to have really close access to the skull, which is the most important part. It was crushed in places and if it had been put on the mount, it wouldn’t have been as attractive as a corrected skull. It’s a big risk to put it up there. What if someone were to throw something at it, either accidentally or intentionally, as an act of vandalism? You want to protect it. Some of the other bones are also fragile but not as scientifically vital as the skull. People can still get really close to it even though it’s displayed in a glass box. It’s a little more difficult to take pictures with it, but if you’re a researcher, they’ll slide it out for you. Anyone who sees the film is bound to dislike Maurice Williams, the man who made $7.6 million for a dinosaur skeleton he didn’t even know was on his property, while the people who dug it up got thrown in jail. Were there attempts made to reach out to his family for interviews? TDM: He passed away in 2011, but his wife and children are still around. We tried contacting them. I was surprised that the FBI didn’t show up at our front door because we tried contacting them so many times. The same goes for some of the other elements within the government that were party to the initial seizure. We did our best to talk to everyone else who knew them and then tried to present them in the light that we had fact-checked. We were already aware of Maurice's character. When Peter was on probation, he went out to South Dakota with the Japanese camera crew. Maurice came up in a pickup truck and sucker-punched him in the back of the head. Pete couldn’t do anything about it considering that he was on probation at the time. If you’re going to sucker-punch the man who gave you 7.6 million dollars tax free, you’re probably not a good guy. What would your advice be to paleontologists hoping to avoid the obstacles you’ve faced? Will money always stagnate progress? PL: Money is always going to play a part, no matter where you come from. It costs a lot of money to do these things. But it’s part of life. We’re a capitalistic society and it has to play a role. It’s very difficult for museums to have their own staff on a regular basis, and The Field Museum is lucky to have one, though they still have very limited field time, whereas private individuals and private companies like ours are out there all the time. There’s a bill that was floated around in many different forms for years and years until it was finally tacked onto the Omnibus Appropriations Act for the Department of the Interior in 2009. The bill deemed the collection of fossils a felony, no matter who you are. I’m very worried about this because it’s really not helpful in terms of scientific progress. There are areas that should be protected and there should be restrictions on who collects what, and so on, but this shouldn’t result in the arrests of scientists. We really haven’t learned our lessons. We have to protect scientists because they are the purveyors of information. They are the ones that make these discoveries. I know there are many people in the government that are trying to do this in the right way and I applaud those people, but I worry still because the letter of the law is so strict that even publishing a locality now can be looked at as a felony. That is the antithesis of science. Next Article: Life Imitating Art: Ira Sachs on “Love Is Strange” Previous Article: Interview: Brenton Thwaites and Odeya Rush on "The Giver"